What a profound read! I am oh-so-affected by what I’ve just read. Am in a state of high-alert with regards to auditory observation ever since picking up One Square Inch of Silence: One Man’s Quest to Preserve Quiet by Gordon Hempton and John Grossmann. Last night I made a bed for myself out in the garden, and slept there, with my never-sleeping ears (there are no ear lids. Ever considered that before? Vision is something we can turn off, hearing is not.) curiously on the prowl for traffic noise, insects buzzing, birds chirping, leaves rustling, my own breath from my steadfast inhalations and exhalations. I even downloaded a sound meter (actually – two, giving completely different results!) on my IPhone, having finally started to understand decibels and auditory measurements. Thanks to this book, I’ve got something to calibrate sound levels against as Gordon in a pedagogical manner jots in current decibel measurements for whatever it is he’s experiencing, giving me something of a map to help me navigate. Also I’ve gotten an understanding of the profound difference in restricting noise versus preserving quiet. Two completely different perspectives, that I’ve never given any thought to before. But now I do. And as I read, I remembered my recent weekend visit at Mundekulla. Walking down the narrow graveled road from the building where we had the course I was taking, to the dining hall where my room was also situated, I noticed the silence. Profound. Peaceful. Powerful! 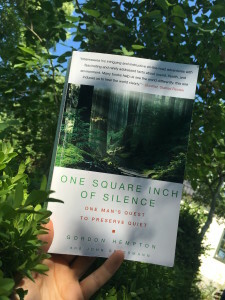 Now, after completing my read of One Square Inch of Silence, I more fully understand why the experience of quiet (which, in Gordon’s definition, means the absence of man-made noise, rather than no sound at all, an important distinction) holds such power over me (us!). This concludes my third encounter with Gordon. You see, I first stumbled upon him while listening to On Being some years ago, an episode I highly recommend. My second run in with him was when we took a family vacation to Seattle and Vancouver in 2016 – with me being adamant to cross the sound to visit The Olympic Peninsula, which I would not have necessarily insisted upon, had I not listened to that podcast. While we were there, we took a day-trip to the western shores. En-route back, we stopped at Fairholme General Store along Lake Crescent, where they had a few copies of One Square Inch of Silence at the counter. So besides buying ice cream and two T-shirts, we also left the store with this book, a spur-of-the-moment piece of shopping of which I am truly grateful.